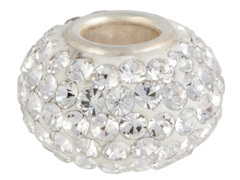 Large hole Sterling Silver crystal bead with single Sterling Silver core. Made with Swarovski crystals. This product was added to our catalog on Monday August 23, 2010. This is absolutly gorgeous. The color will knock your socks ..
All content is copyrighted material. All use, reproduction and/or publication rights reserved worldwide. Web Design/Content Copyright (C) 1999 - 2019 INM Crystal, Inc.